The key products and/or service pages need to rank well in Google and to do this they need to have the best on-page SEO techniques. While, these tactics can increase a page's SEO performance they should be part of a larger strategy for your website that also drives traffic and improves domain and page authority. The success of a single page's SEO comes down to providing content that is relevant to a users' search in a high-performing, easy to digest format. Your SEO page (website) needs to use and integrate keywords that tell Google what your content is about and provide a great user experience. Keywords: Keywords are the words users enter in a search engine. They are also the main information Google uses to connect a users' intention and with its search engine results page. However, there are a lot of different keywords someone can use to look for the same content. 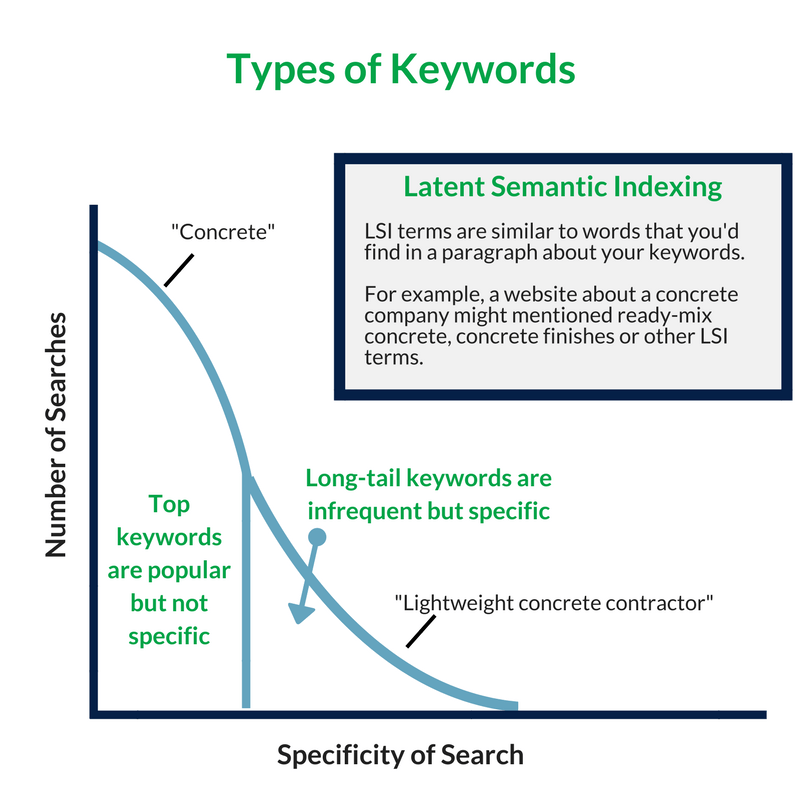 For example, "Concrete" and "Lightweight Concrete Contractor" are two keywords users could type looking for the same thing – concrete - but the latter is much more specific. It is also used less frequently. These specific but rarely used keywords are called long-tail keywords. Google also looks for words in your page found in content related to those keywords. This is called latent semantic indexing (LSI). For example, "ready-mix" can be a LSI term for "Concrete". A good SEO keyword strategy includes top keywords, long-tail keywords and LSI terms. There are many tools available to identify the right terms to use but two popular tools are Moz's keyword explorer to identify keywords and LSI graph to find LSI terms. Links: Links also help Google understand what your webpage is about. This is done with both links to other pages on your site (internal links) as well as external sites (outbound links). These links should point to relevant pages, which enables Google to reinforce its understanding of what is on your page by putting it within the context of the content on the pages you link to. Great, relevant content: Be careful to not create content that overly uses keywords. Once a standard SEO strategy, keyword boosting creates hard to read content and is no longer favored by Google. The primary function of your content needs to provide the information your users want. 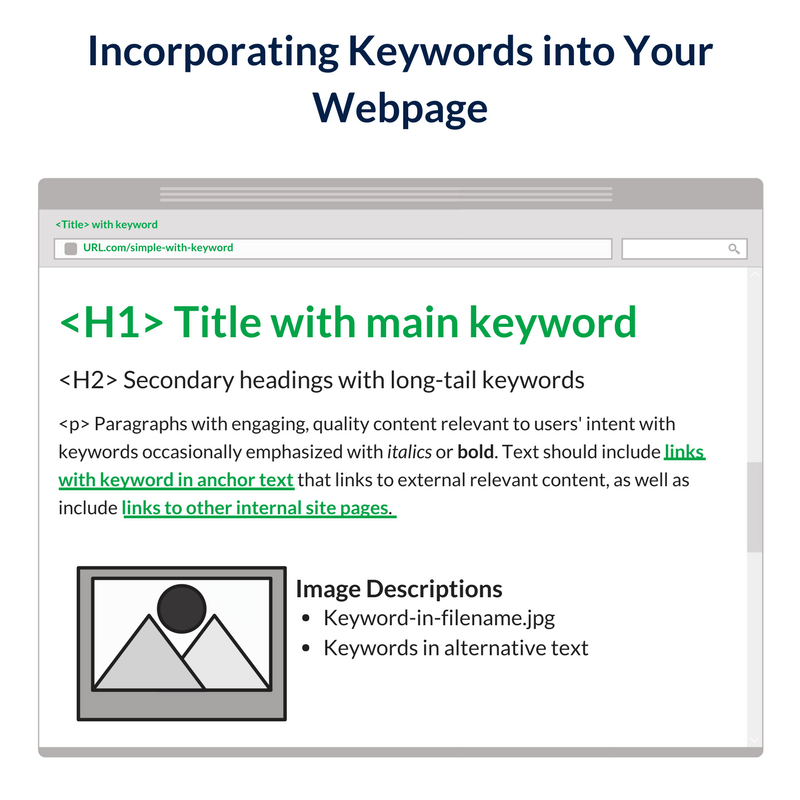 When this process works, keywords are integrated seamlessly into readable, relevant text because your page's content matches users' search intent and keywords well. the URL address text itself. Including keywords in these tags informs Google what your page, media and overall content is about. Incorporate keywords as well as LSI keywords into the text occasionally. These keywords can be emphasized with italics or bold type and should be incorporated into the anchor text (the highlighted text) for links, particularly the first link on the page. Keep users engaged: A high bounce rate, or a percentage of user visits that include only one page, is a strong indicator that visitors are not engaging with a page. You can monitor a page's bounce rate by using Google Analytics. A high bounce rate does not indicate a specific problem but rather it is a symptom demonstrating that there is an issue with your website’s page. By contrast, a page that keeps users engaged will keep visitors on the site longer and viewing more than one page on average per session. High quality media: Text is not the only type of content on a webpage. Visual content more quickly captures an audience and should be integrated throughout your page. Other media should be as relevant and interesting to users as the text itself. Page layouts for different devices: A responsive website is simply a site that responds to a browser's viewing size. Since mobile search eclipsed desktop search in 2015, users as well as Google have favored sites that have a great user experience on multiple devices. Designing a site mobile-first will ensure that you have a good experience on mobile, and one that is more likely to translate to a positive desktop experience as well. Providing a desktop-type experience on mobile is cluttered and will contribute to low user engagement and a high bounce rate. Fast load time and secure page: We are all impatient internet users. A page that does not render properly, has too many ads or pop ups, or is simply slow, is more likely to be abandoned by a user before s/he read its content. Low marks in any of the above performance metrics will also contribute to a high bounce rate. Google will also penalize a webpage if it is not securely delivering content via https. High page performance metrics are essential for giving yourself that opportunity to engage users with content. The above SEO techniques are tips for you to improve your website's ranking and your core services or product pages. Improving your website's ranking and individual page rankings within search engines will help ensure your product/company is found and attract your targeted audience. Search Engine Optimization is just a piece of a comprehensive digital marketing strategy. Contact us today if you have any questions about our SEO services or would like to schedule a no obligation discovery call. Scott is a project management expert and assists WSI Connect with client deliverables, content creation, and graphic design. He holds a BS in Biomedical Engineering, Electrical Engineering, Latin American Culture from the University of Rochester and an MS in Management Science & Engineering from Stanford University.